First outdoor crown for Oregon since 1984 (held in Eugene) … Highest winning men’s score since the introduction of the eight-deep scoring system in 1985 [previous best was 83 by Arkansas in 1994] … The Ducks’ score is the second-best between both genders in that same time frame, surpassed only by the 1993 LSU women’s 93. Oregon’s winning margin of 18 over Florida (70 points) snapped a streak of five straight men’s team races decided by two points or fewer, and is the biggest margin of victory since 1994 when Arkansas won by 38 points over UTEP (83-45). With a men’s sweep of the outdoor and indoor team titles combined with an indoor team title for the women, Oregon becomes just the second school to claim three out of the four track & field team titles between both genders, joining LSU’s 1989 program (indoor – men & women; outdoor – women). Texas A&M has now claimed four of the past six national team titles (2009-11, 2014) … The Aggies’ winning score of 75 points is the highest since the 2002 South Carolina women won with 82 points, and the eighth-highest since the eight-deep scoring system was introduced in 1985. Texas A&M’s winning margin of nine points is the slimmest since 2011 when the Aggies won by four points over Oregon, 49-45. Texas’ 66 points as the runner-up is the highest by a second-place team since LSU’s 68 in 2004, and the fifth-most scored by a runner-up team since the meet introduced an eight-deep scoring system in 1985. Prandini’s 24 points is the most by an individual in an NCAA meet since 2001. Arizona’s Brianna Glenn won the long jump and 200 meters and placed 3rd in 100 meters in 2001 at the meet in Eugene. … the all-time best in an NCAA outdoor meet by a female is 28½ by UCLA’s Gail Devers in 1988 (1st 100, 1st 4×4, 2nd LJ, 2nd 4×1, 3rd 100H). Dukes’ time, the fourth-fastest time in NCAA meet history, regardless of conditions … he is the first man from Florida to win the event since John Capel in 1999 (19.87), and just the third man since the turn of the new millennium to dip below 20 seconds under any conditions (Maurice Mitchell of Florida State in 2011 and Arkansas’ Wallace Spearmon in 2005). Dukes is Florida’s first outdoor champ in the event since Capel in 1999. Defending Champion Mac Fleet (Oregon) wins and is first to win back-to-back titles in the event since Seneca Lassiter (Arkansas) in 1997 and 1998. Fleet pushes Oregon’s all-time total of outdoor crowns in the event to 12 (combining all-time history of 1500 meters and mile) … only Villanova’s 13 all-time tiles ranks higher. Kebenei tripped on final barrier, but was otherwise neck-and-neck with Rotich in the final lap. Rotich is first back-to-back champion since Matt Hughes (Louisville) in 2010-11 and is the third man in UTEP’s history to win consecutive steeplechase titles, joining Jim Svenoy (1994-95) and James Munyala (1975-77) … The only other school with two men who have won this event in consecutive years is Arkansas. Rotich, the 2014 NCAA indoor mile champion, is the first man in Division I history to win both the indoor mile and the 3000-meter steeplechase in the same academic year. Two fastest times in NCAA meet history, besting the previous meet record of 13.21 set by Tennessee’s Aries Merritt in 2006 … Allen also moves to No. 2 on the all-time collegiate performers list … Harris joins Maryland’s Renaldo Nehemiah as the only two to run sub 13.20 twice as a collegian in-season. Allen first freshman to win the event since 1976 (Dedy Cooper, San Jose State). Defending Champion Wayne Davis II (Texas A&M) finished third … Davis is the active career leader in points scored in the event with 27 (6th 2011; 2nd 2012; 1st 2013; 3rd 2014) … The all-time points leader in the event (since 1982) is Illinois’ Andrew Riley (32). Texas A&M just off collegiate record of 2:59.59 set by LSU in 2005 … Texas A&M’s time is also second-best in meet history. … A&M under three minutes for the first time in school history, becoming the sixth team to do so … first NCAA winning time under three minutes since 2009 (Florida State). Western Kentucky finished fourth — its best finish in an NCAA outdoor event since 1992. Florida has won the event five years in a row (Christian Taylor, 2010 and 2011; Omar Craddock 2012 and 2013; Dendy, 2014). … Florida’s Marquis Dendy (the long jump champ) is the collegiate leader, 16.52/54-2 1/2 … Last to sweep both titles at the same championship meet was Walter Davis (LSU) in 2002. The long jump/triple jump sweep has been achieved eight previous times by six individuals. Defending champ Omar Craddock (Florida) graduated. 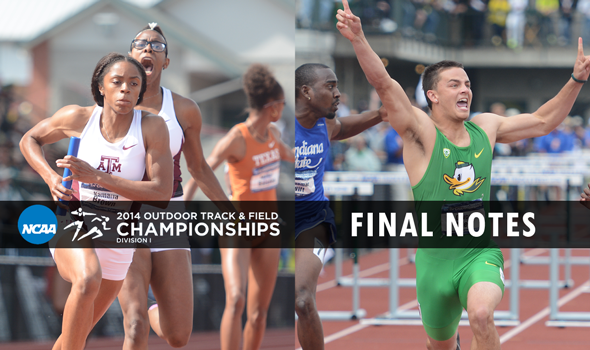 … NCAA indoor champ Felix Obi (Baylor) did not advance to Eugene. Joins his uncle, Brian, as an NCAA javelin champion. Brian won the event in 1982 and 1985 … His father, Dean, claimed NCAA throws titles in the shot put/discus in 1982 and the discus in 1983 … Cousin Ryan claimed his second consecutive national shot put title earlier this week. Collegiate leader Kyle Quinn (Tennessee) finished 18th at the preliminary round in Jacksonville, not qualifying for the final rounds in Eugene. Jones (Penn State) 22.68, 4th … closest finish in meet history between the winner and second-, third-, and fourth-place. Brown is Texas A&M’s first winner of the event since 2010 (Porscha Lucas) … A&M’s four titles all-time is now tied for second on the all-time list (LSU 8, Texas 4). Prandini scores 24 meet points (1st LJ, 2nd 200, 3rd 100) [see note above]. Three-time Defending Champion Kimberlyn Duncan (LSU) — winner of the 2012 The Bowerman Trophy — graduated … NCAA indoor champion Dezerea Bryant (Kentucky) did not start the semifinal on Thursday. … collegiate leader, Texas A&M’s Olivia Ekpone, finished third. 1:13 at 400 meters … two laps to go … shuffling pushed Oregon to inside the rail (no violation indicated by umpires) … 3:16 lap to go (Houlihan, Hall) … 3:32 after 1200 … McGee makes move to the front with 250 to go … Houlihan took back lead with 180 to go. Houlihan wins first 1500 meter crown in school history and first Arizona State crown in track events since 2006 (Victoria Jackson, 10,000 meters). Collegiate leader Stephanie Brown of Arkansas finished eighth. Nelvis’ and Stowers’ times rank fourth and fifth in NCAA meet history, regardless of conditions. … in collegiate history, Nelvis’ time is sixth all-time, regardless of conditions while Stowers ranks tied for seventh. Hall is Texas’ first 5000 meter champ since 1987 (Annie Schweitzer). … Hall took the lead prior to the bell. Two-time Defending Champion Abbey D’Agostino (Dartmouth) finished third. D’Agostino finished career with 32 career points in the event outdoors, a meet all-time best (3rd 2011; 1st 2012; 1st 2013; 3rd 2014); the previous all-time leader was Stanford’s Fleshman (30). Texas A&M has won this NCAA event title in six of the last seven years and appeared in the final for the seventh-straight year. First Texas title in the event since 2009 … Longhorns have nine NCAA titles in the event outdoors, the most all-time, three ahead of nearest challenger (LSU, 6). Sophomore Courtney Okolo’s anchor time of 49.58 ranks No. 2 in meet history, trailing only Texas A&M’s Jessica Beard’s 49.13 (2011). Texas’ time was the second-fastest in collegiate history, behind only its own collegiate- and school-record time of 3:23.75 (2004) … Texas A&M’s time ranks No. 7 in collegiate history all-time. Defending champion Arkansas finished sixth. Kallenou is the indoor and outdoor champion in the event, joining last year’s winner Brigetta Barrett as the last two to accomplish the feat. … Kallenou is Georgia’s first outdoor high jump national champion. Defending champion Brigetta Barrett (Arizona) graduated. Hillman becomes the sixth woman in a row to sweep the indoor and outdoor shot put titles (Tia Brook, Oklahoma in 2012-13; Julie Labonte, Arizona in 2011; Mariam Kevkhishvili of Florida in 2009-10) … Hillman is the first underclassman winner of the event since Arizona’s Julie Labonte (2011). … Hillman is also Iowa State’s first female to win a national outdoor crown in a field event. Collegiate leader Kearsten Peoples of Missouri finished third.